So I’ve been trying to keep to keep to a schedule of finishing a comic at least once every two weeks, but alas things have been pretty busy this week and I’ve overbooked myself. 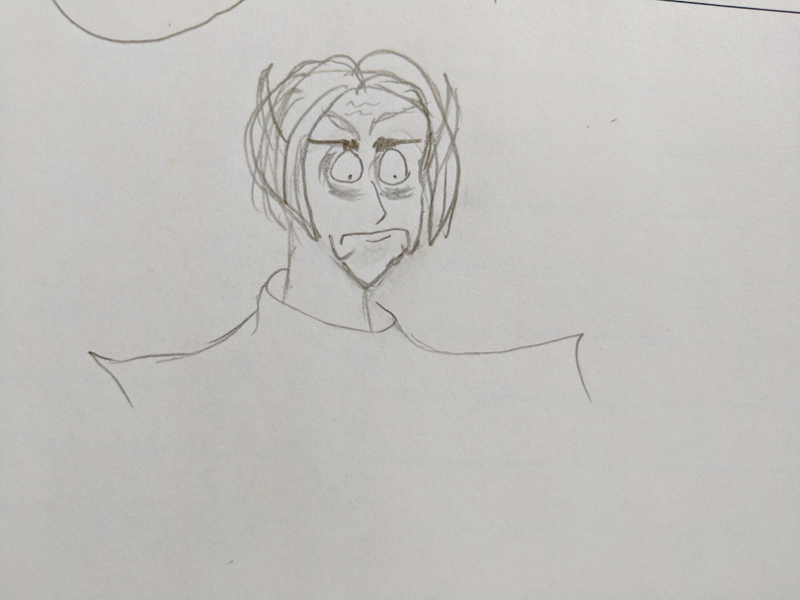 So you get a planning-stage sketch of an incredulous Master Aryon instead of a finished comic. And usually some combination of all three. This sketch is a plan for a punchline panel for a comic I have in mind. But then I realized that I have at least 3 comics planned that have this as a punchline, so maybe the “Steen drives Aryon crazy as a punchline” isn’t as consistently funny as I thought. I’ve even found myself recently trying to do things in-game because I know it will get Steen in trouble with her mentor. One day I decided I would design a recall-on-touch spell, and then run around sending a bunch of randos into Aryon’s tower. I had the whole scenario planned out in my head. Master Aryon would walk in to see a bunch of people chatting and mingling in his tower, and then he’d immediately know that Steen was to blame, and then bust her because she was in direct violation of his no-parties rule. Imagine how heartbroken I was when I discovered that the game does not allow you to make a Recall on Touch spell. I get it, that would make fights way too easy, you could just teleport them away. But I feel like the game should have made an exception for me, because I just wanted to use it to throw a party in Aryon’s tower and get busted. I would never use it in actual combat situations! Just for mischief! I’ve started planning an alternate scheme for throwing a party, though. It is much more tedious, but it will all be worth it when I end up throwing a rager at Aryon’s place. I cast Command Humanoid on touch, and then Levitation on touch, and then lure the guests one by one up into the tower. Unfortunately, this means that probably all the guests will have to be from Vos because it is close by, and that is less hilarious than having a ton of total randos at the party. Alas! This entry was posted in Art, Silly and tagged Comics, Master Aryon, Morrowind, The Elder Scrolls. Bookmark the permalink.